Plants are the Strangest People: Anthurium no. 0408 "Tex Messich"
You know, I'm beginning to think that maybe I don't even like Anthuriums that well. I mean, that's obviously a ridiculous thing to say. You're thinking, "maybe I don't even like Anthuriums that well," says the guy with 750 Anthuriums, ha ha, it is to laugh. Which is fair. But. Some of this is because the Schlumbergeras have just made their triumphant return, after a long period of fondness-making absence, so the Anthuriums look less interesting by comparison. Perhaps if they stopped blooming for a while, and then came back, I'd like them better. But the biggest issue is still, unsurprisingly, the ongoing thrips and scale problem. I have abandoned the taping idea, after it became clear that I didn't actually want to do it,3 but the problem is still there, and at this point it's been going on for nearly four years. I am tired. I'm tired, and I'm out of ideas. I would never get rid of all the Anthuriums, but I'm certainly considering trying to reduce their overall number. Probably by freezing the potting-up of new seedlings, to let the existing seedlings whittle their numbers down a bit, but I might also do another purge and get rid of some seedlings on purpose. Still trying to work out what I want to do. 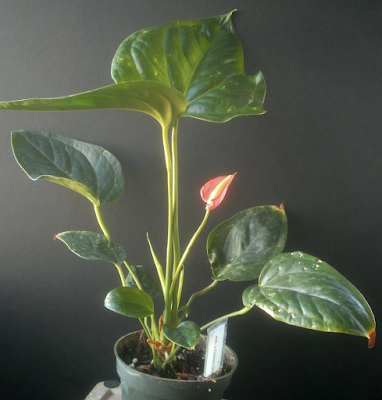 About 30 Anthurium seedlings, ones I moved to 6-inch pots, are safe no matter what. (I wouldn't have up-potted them if they didn't have a lot going for them, including some level of thrips and scale resistance.) The question is how many of their compatriots will be allowed to try to bloom, and under what circumstances. Tex was initially disappointing, mostly from the amount of thrips scarring on the spathe. Tex is also on the small side of average, and the peduncle is pretty short. Both are forgivable, but small, short, and attractive to thrips is a bad combination. Initially, I didn't care for the color, either, which was reminiscent of its sibling 0416 "Holy McGrail," but as time's passed, I've sort of come around about the color. It's not that I think this is a particularly pretty hue -- I'd call it "dirty pink" -- but it's at least interesting. 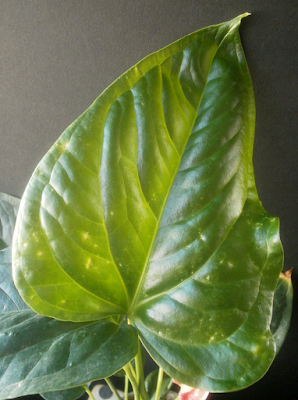 The plant as a whole is a good size, and the leaves are large and shiny. Without all the pockmarks, they might actually be pretty. So about Tex: my head says there will be something better later, just throw him out, and my heart says but he's pretty cool; at least it's sort of a new color. So we're deadlocked. I'll have to revisit the decision later, when I have more information. 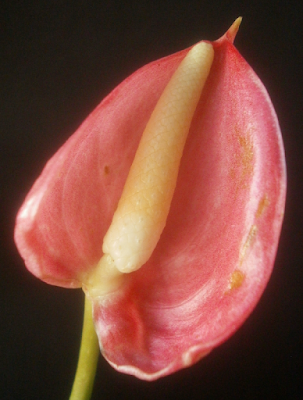 Whatever happens to Tex in the long run, I am a little more firmly decided that some of the space presently occupied by Anthuriums should be switched over to Schlumbergera production, though. There are almost three times as many Anthuriums in the house as Schlumbergeras, but I'm certainly not getting three times more enjoyment out of the Anthuriums. So there's a course correction on the way. 3 This became clear when I noticed that every time I had a block of time large enough to permit taping, I found something else to do instead. Eventually I took the hint from my subconscious, and stopped feeling guilty about not doing it. In retrospect, I would probably have found it easier to do if I hadn't also convinced myself that it wasn't likely to work. I mean, I truly do think it wouldn't have worked, there's no way it could have eliminated all the thrips and scale, but it might still have been helpful. I've noticed some (not all) of the flats I taped are doing better since. It may not have been worth the effort, but the effort wasn't entirely wasted.